GOVERNMENT and opposition MPs and NGO representatives from 18 countries made a significant commitment to gender equality and sustainable development last weekend, but the forum received limited coverage from New Zealand and international media. More than 70 delegates from across the Pacific were in Wellington for the Pacific Parliamentary and Political Leaders Forum, including New Zealand’s Deputy Prime Minister Bill English and other National, Labour, Green and independent MPs. Delegates agreed on the need for greater action around gender equality, climate change and healthcare - but overwhelmingly rejected a push from the World Bank to free up trade conditions and deregulate economies. NZAid invested $330,000 in the forum - the first of its kind in New Zealand history - but media coverage was scarce. 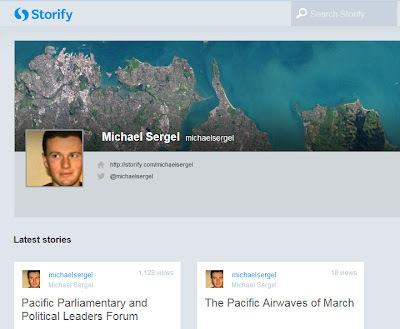 from him and fellow AUT student journalist Finian Scott have featured on Pacific Scoop. Discussions on media freedom at the just-ended Pacific Parliamentary and Political Leaders Forum in Wellington have highlighted deep divisions in Fiji media, reports Radio NZ International. 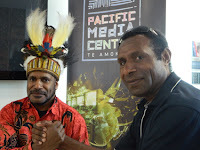 Pacific Scoop and Pacific Media Centre Online have comprehensively reported the forum with a team of student journalists who have been running a live blog (see below). FIJI'S GOVERNMENT insists it supports media freedom but has cautioned that it won’t tolerate what it calls misreporting or media coverage which fuels racial division. But in its 2013 global report, Reporters without Borders says that Fiji journalists still operate under a media decree which imposes the threat of heavy fines or imprisonment as in the case of a recently convicted editor of the Fiji Times. However Tura Lewai of the Young People’s Concerned Network told delegates at the Wellington forum that media in Fiji is gagged by the point of a gun. The International Consortium of Investigative Journalism (ICIJ) investigative series on offshore secrecy – which draws from a cache of 2.5 million leaked secret records – has ignited reactions around the globe, including the Pacific. Bayartsogt Sangajav: resigned his post after offshore account revelation: Bayartsogt Sangajav, deputy speaker of the Mongolian Parliament, has reportedly resigned from his post following ICIJ's revelations about his undeclared offshore company and bank account. In a parliamentary session he was asked to explain his actions. Several MPs called for further disciplinary action, including expelling him from Parliament entirely. Santosh Kumar Agarwal (Kedia), a member of the board of directors for the Antwerp World Diamond Centre, has resigned from the organisation after his offshore dealings were revealed: “In the interest of the integrity of the Antwerp World Diamond Centre as [an] organisation and the industry as a whole, Kedia has taken the initiative to withdraw from the AWDC's board of directors, awaiting the outcome of a potential investigation,” said a statement released by the company. ONCE again a major Pacific event on New Zealand shores has received scant media attention. Gender equality, climate change and freedom of expression and media issues all scored points on the first full day of the Pacific Parliamentary and Political Leaders Forum in Wellington this week. Samoan Justice Minister Fiame Naomi Mata’afa says achieving gender equality is essential to the achievement of successful social, economic, and political development in countries. 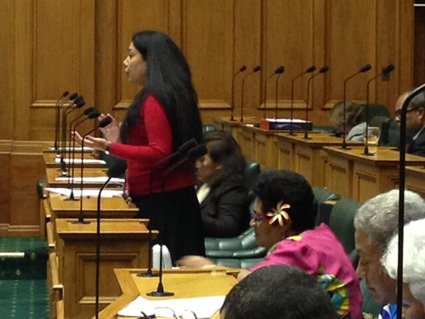 Yet there was just a sprinkling of Pacific women from the region actually among the 70 delegates to hear her message. Ironically, it took a live blog from two AUT University student journalists to provide the only real coverage. Six of the only seven stories to register online in a Google news search 24 hours after the start of the forum were filed by them, or via their blog piggybacked on Pacific Scoop and Pacific Media Centre Online. Awesome Michael Sergel and Finian Scott! They organising their reporting stint this week, assigning themselves to Wellington from their Auckland campus with none of the resources sported by bigger media organisations, not much more than their mobile phones. 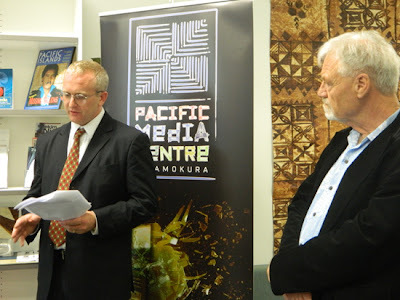 An address by Scoop editor and general manager Alastair Thompson for the launch of the Scoop Foundation project and Pacific Scoop Internship at AUT's Pacific Media Centre. In a push to offer new support and momentum for public interest journalism, New Zealand's leading independent news provider, Scoop Media, is lending its weight to two initiatives being announced for the first time. The first initiative, the Scoop Foundation Project, brings Scoop.co.nz together with a group of New Zealand’s leading practitioners of public interest journalism to create a charitable trust to fund investigative journalistic work. This coincides with the launch by Scoop of a $5000 Pacific Scoop internship being awarded in conjunction with AUT University’s Pacific Media Centre (PMC). The first recipient, Danish radio journalist Daniel Drageset, was named at the School of Communication Studies Awards event held at the newly opened Sir Paul Reeves Building at AUT last week. The name for Scoop's "Scoop Foundation Project" plays on the associated ideas of "foundation" and "construction". It is clear that we now need to build a new journalism. The one that we have has been struggling for some time, and a key component of it - print - is now on life support. And to build a new journalism we need to start by (re)constructing some foundations. And that is what the Scoop Foundation project will do. The first important thing to understand about the Scoop Foundation Project is that it is a completely separate entity from Scoop Media Limited, publisher of the Scoop.co.nz. THE RIGHTWING Danish MP who stirred an upheaval Down Under with her attack on taha Māori – traditional rituals and protocols that are basic to everyday life in Aotearoa/New Zealand – barely seems to have any understanding of the country she visited last month. But underneath all the defensive bleatings from the PC brigade this week in response to Marie Krarup’s misguided criticisms of a “grotesque” powhiri with “half-naked” men poking out their tongues published in the tabloid BT, her arguably more damaging condemnation of New Zealand’s "humanitarian" military seems to have largely gone unnoticed by mainstream media. Only Pacific Media Watch’s Daniel Drageset, a Norwegian radio journalist who is a postgraduate student at AUT University and who has a fluent command of Danish, seems to have got the point. He took the trouble to translate Krarup’s original commentary on her blog and his story Danish MP apologises after calling Maori powhiri ‘grotesque’, mocking ‘free-ride’ defence was run in full on Pacific Media Centre Online and Pacific Scoop. Clearly Krarup had no idea that she was being given a great honour with a cultural welcome that has a history going back centuries. And several "embarrassed" Danes have written to PMC and Pacific Scoop criticising Krarup over her views. Although Krarup might seem a minor political player, being the defence spokesperson for the third-ranked party Danish People’s Party ( a mere 12.3 percent of the votes in the 2011 election), which has extremist views against migrants (especially Muslim), she was in fact a member of the six-strong Danish Committee on Defence visiting parliamentary group. One of the Bali police bribery segments in the 'Fraudsters Abroad' programme. INDONESIAN authorities have been dealt another embarrassing blow when a second video shot by Dutch stunt journalist Kees Van der Spek hit YouTube this week. Van der Spek, a journalist for the Dutch TV station SBS6, secretly recorded a customs officer at Bali's Ngurah Rai Airport demanding a $200 bribe. The video was posted days after another undercover shoot showing extortion by Bali police made headlines in Indonesia. Both segments are part of a new Dutch show titled Oplichters in het Buitenland ("Fraudsters Abroad"). In the 42-minute show, Van der Spek and his crew travel the world, breaking the law to expose scams and extortion attempts by local authorities. In the latest video, the undercover journalist's team is held up by customs officials at Ngurah Rai Airport. The crew was attempting to arrive in Indonesia without necessary filming permits from the Indonesian Embassy.